What a way to start the day!! Hot and hearty breakfast sliders right out of the oven are sure to brighten up your morning! Not gonna lie, a warm breakfast sandwich almost makes me happy to wake up early in the morning! 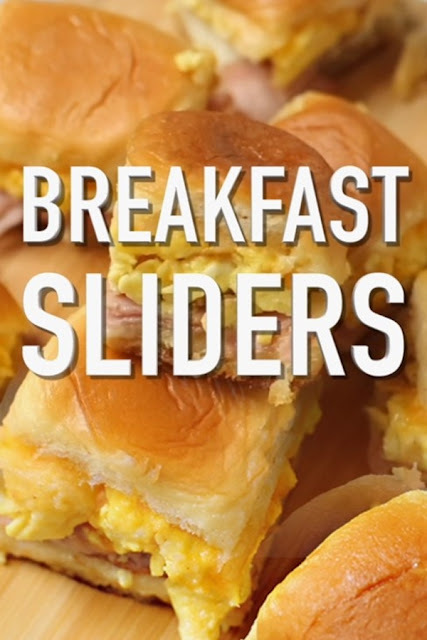 Breakfast sliders are a fun weekend treat for the family or overnight guests. They’re super easy to prep and pop in the oven — ready start to finish in 30 minutes! (Which is about the same as any hot meal you’d make for breakfast). Keep reading for step-by-step instructions, including lots more drool-inducing photos. I’ve also sprinkled in some of our “secret” family cooking tips to make the perfect breakfast sliders! A free printable copy of the full recipe/ingredients is available at the bottom of post. Cut the sandwich sheet in half through the middle to create two "slices" of sandwich sheet. (You want the individual buns to stay together). Place the bottom half of the sandwich sheet in the casserole dish. Set aside. Prepare a frying pan over medium heat with a teaspoon of your choice butter or cooking oil. While pan heats, crack eggs into a medium size bowl and whisk until fully blended. Pour into the preheated frying pan and stir constantly, until eggs are thoroughly cooked. Remove frying pan from heat and set aside. Place an even layer of the ham on top of the bread. Follow with the eggs, and then the cheese. Top with the slider buns and then pour the melted butter evenly over the sandwiches. (For a lighter version, use 1/2 cup butter instead of 1 cup). Cover the casserole dish with tinfoil. Bake at 350°F for 20-30 minutes until the butter has completely absorbed into the rolls. Cut and serve. Best enjoyed warm.